Station Casinos is almost one step closer to completing its upgrade to Palms. This summer KAOS will replace Rain Nightclub in a major way. The new club will be an indoor/outdoor facility with numerous residencies and full band concert performances. Station Casinos purchased Palms in 2016 and started the major property-wide upgrade in 2017. The first phase of renovations on the casino floor was finished last May. I visited Palms to check out the renovations shortly after that phase was complete. The first phase looks great and the second phase is nearing completion. The new themed suites are a major upgrade. The new Empathy Suite was designed by artist Damien Hirst. This and the other suites are a major upgrade to the suites that help make Palms so popular with it first opened. New restaurants will continue the upgrades on the casino floor. The new pool and nightclub will be both separate and together when they open this summer. KAOS will open in April and be a fully integrated 73,000 square foot dayclub and 29,000 square foot nightclub. The new club will feature exclusive residencies with world-renowned musical artists, state-of-the-art audio, video and lighting technology and dramatic design and art elements throughout. These are just some of the resident artists for the dayclub/nightclub. There are plenty more resident DJ’s at KAOS. That’s just the beginning of the entertainment. KAOS Dayclub will be a multi-level dayclub that offers two main pools, numerous side pools and 39 unique cabanas (most with their own private pool). 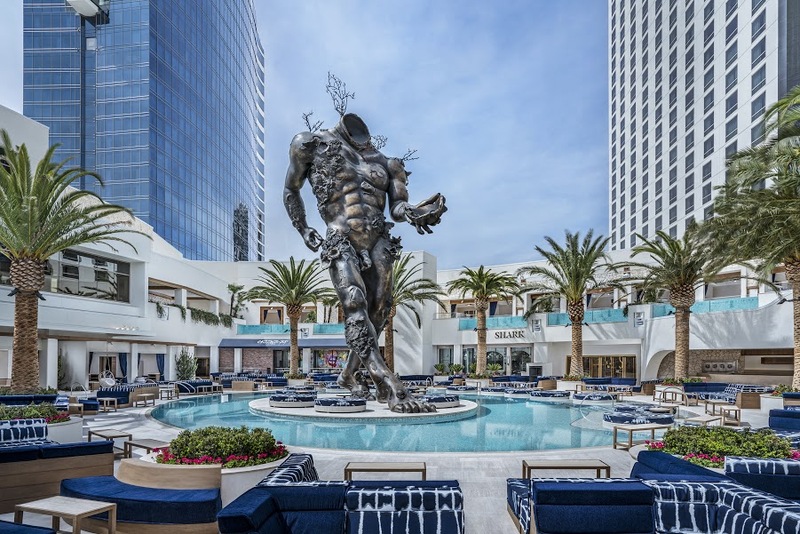 The focal point of the dayclub is a towering 65-foot bronze sculpture by Damien Hirst entitled “Demon with Bowl.” This massive statue rises up from the center of one of the two main pools. KAOS will seamlessly blend the nightclub and dayclub experiences with a huge retractable glass wall/door that allows clubgoers to easily move between the indoor and outdoor venues. The nightclub has a rotating 360-degree DJ booth that allows talent to play to both indoor and outdoor crowds. The dayclub has its own separate entertainment stage in order to provide for multiple performance locations. Palms just announced their first outdoor concert. 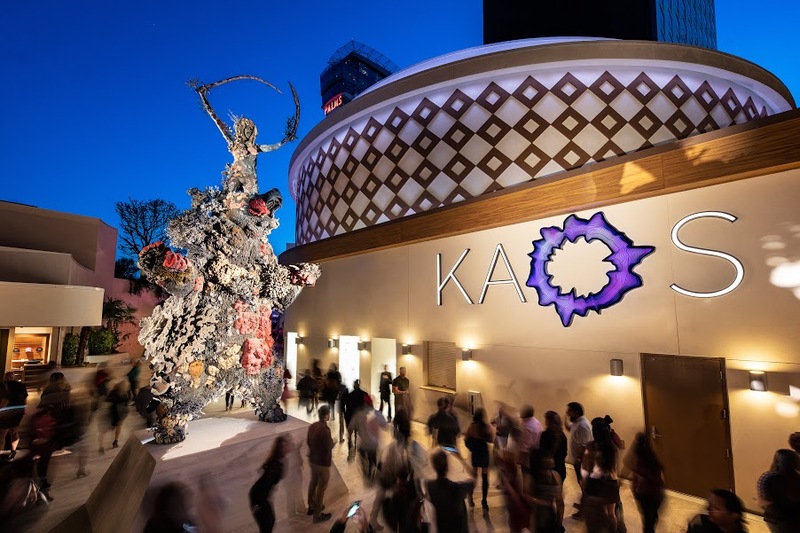 The opening weekend slate of events at Palms will kick off on Friday, April 5, with a performance by Alicia Keys inside the Pearl Concert Theater. The party moves to KAOS after the show where Skrillex and Travis Scott will be the performing.